Review - Main Aur Mrs Khanna: Where's the love? The promos of Main aur Mrs. Khanna are quite misleading as they would have you believe that this movie is a Salman Khan movie. For all the Salman Khan fans out there, THIS IS NOT A SALMAN KHAN MOVIE. But if you want to see him anyway, go right ahead and watch it. Watch out for Bappi Lahiri. So when a guileless Salman Khan worshipper like myself, gets ready at 8 in the morning,(and mind you, GETS READY and not just WAKES UP), to go for the latest Salman Khan movie, the least she (or in some cases, he) can expect is for that movie to be a Salman Khan movie, right? Wrong. Apparently, nowadays, it’s okay to lead the audience on. You can show them something and not deliver. So when you project Main aur Mrs. Khanna as a Salman Khan starrer, you can get away with ensuring that the Khan with an attitude makes a single appearance on either side of the interval. 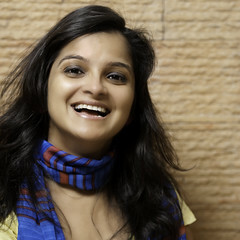 Main aur Mrs. Khanna, to say the least, is the work of an extremely confused filmmaker. Perhaps, Prem Soni, the director, screenplay, story, and dialogue writer (phew!) of this movie, started off with a fair idea of what he wanted to show, but somewhere in the middle, just lost it. What could otherwise have been a pretty good movie turned into a so-so fare by the average treatment meted out to it. The plot is interesting but it is let down by a loose screenplay. Also, a film like Main aur Mrs. Khanna could have done with a lot more drama in it. 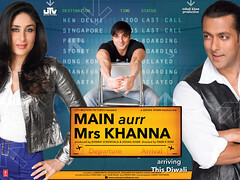 The main flaw, however, in Main aur Mrs. Khanna lies in characterization. The characters, especially the lead characters, are not etched definitively. If you were to define a singular character in the movie in just about one word, you wouldn’t be able to do so. For that matter, even if you were given as many words you liked, you still wouldn’t be able to do so. Primarily because right till the end of the movie, you have no idea WHO these people are. Sure you know their names, you know their profession. But the connect that a viewer has with a character, is sorely missed. We don’t feel for Kareena when she cries, nor do we laugh when she laughs. This movie commits the cardinal sin of being just something that we are watching on the big screen – it forms no relation with its audience. The first half is slightly flat but the tempo picks up a little in the second half. In fact, the second half can squeeze quite a few laughs out of you. Just when you think that the movie might just start living up to your expectations, the plot falls flat again. The end is, in fact, very patchy and some details in the end are just plain unnecessary. Another sphere where the movie lacks is the chemistry between the lead pair. A movie that is trying to put across a message about love and relationships simply cannot do without absolutely sizzling chemistry between the lead (or so the promos say) couple. The missing chemistry, however, is not the actors’ fault it is more the director and story/screenplay writer’s fault. He just hasn’t etched characters strong enough to portray any sort of relationship. The look of the movie otherwise is good. The locales are good, as is Kareena’s styling. From the glam doll in Kambakht Ishq to girl-next-door (or at least Kareena’s version of it), Kareena’s look has definitely undergone a change. However, it is at odds with the character she plays. How can an orphan afford such expensive clothes? Salman is well, just Salman. No need to say anymore. He looks good and acts like he always does. However, the age is definitely beginning to show a little, and the whole ‘young couple’ look kind of goes for a toss. Sohail Khan has probably delivered his best performance to date in this movie (which isn’t saying much, considering he has acted in movies like Aryan; but he is quite good here). Yash Tonk is funny in bits and unnoticeable in other bits. Nauheed Cyrusi and Mahek Chahal might as well have been carved out of stone and Dino Morea had a blink-and-you’ll-miss-it appearance. The surprise package of the movie came in the form Bappi Lahiri, who was in his element as Kareena’s boss. Music is passable, with just one track, Don’t Say Alvida standing out. Preity Zinta’s item song is just about okay. Choreography is not spectacular or even noticeable. Other technical aspects are just okay, though the flashback technique, of going into a black and white zone, looks quite nice. Salman Khan fans might be a tad bit disappointed, though, with the size of his role. Watch only if you must. Till then keep guessing ki ‘Kiski Mrs. Khanna’ (whose Mrs. Khanna). This review is by guest reviewer Akashi Kaul. Akashi is currently doing her Masters in Journalism but she doesn't see the point in waiting another 6 months for a degree to voice her opinion about movies. Besides, she was tired of having her entire movie-experience destroyed by some reviewer revealing the entire story in the garb of a review. Akashi Kaul also blogs at http://www.withlittlethoughtornone.blogspot.com/. Nay! Thumbs Down, by TimELiebe : Salman Khan abandons wife Kareena Kapoor in the Melbourne Airport - and audience confusion ensues. • The scene in the flashback, right in the beginning of the movie, when everything goes from black and white to colour when Salman lights a candle in the church where Kareena’s praying, asking for a sign. • The whole ‘love at first sight’ between Kareena and Salman; Sohail and Kareena’s angle was built better than Kareena and Salman’s even though the later is supposed to be in love. Sorry @TimELiebe Akashi doesn't write for wogma any more and it's difficult to trace her down. I haven't seen the film, so I can't comment either. Totally depressed after watching the much hyped London Dreams..what is happening,thought the curse of bollywood maata would be over after diwali!! oops..will not hijack your review of it..!! Humayun has given this movie a So-So. Humayun has posted 2 comments and has rated 2 movies. See Humayun's page for more details.